offers assistance in logical data recovery for both individuals and companies and provides professional remote services, among which, besides the third-opinion and the logical data recovery itself, is the development of custom software tools for complex data loss cases. Choose your personal assistant in data access and recovery. Never download or install the software to the storage you have lost your information from. Why? 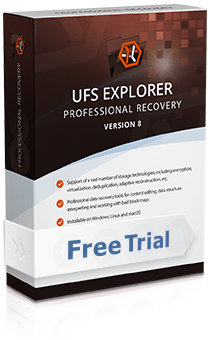 UFS Explorer Professional Recovery is highly efficient software created for solving complex data loss cases. With an advanced toolkit for work with different storage technologies, including RAID, virtualization and encryption, the utility is a perfect assistant for data recovery specialists. All UFS Explorer products are created as 'shareware', meaning, you can try the product before you buy it. It's strongly recommended to check out the trial application before purchasing software license to ensure that it matches your needs and has all required functions. Linux version can run from most modern Linux Live CD. "Save" function of certain hexadecimal viewer/editor dialogs is disabled. 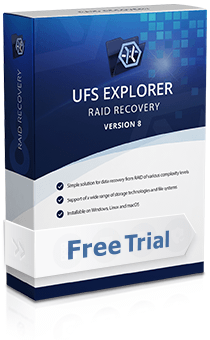 UFS Explorer RAID Recovery is software solution for common data loss cases and for data recovery tasks related to RAID systems of any level and complexity. This cross-platform program works with different file systems and a wide range of storages. The software embraces all tools necessary for efficient data recovery from complex storages. The software copies files with the size under 768 KB only. Never download or install the software on the storage you have lost your information from. Why? UFS Explorer Network RAID is a software application aimed at data recovery from RAID systems of any level and complexity. This program allows restoring lost and deleted files from a RAID system over a local area network, making simultaneous data recovery performed on several computers possible. UFS Explorer Standard Recovery is an essential utility for common data loss cases, including accidental deletion of files, storage formatting, software and hardware malfunctions. This cross-platform software works with a broad set of file systems applied in Windows, macOS and Linux allowing users to successfully restore files created in these operating systems regardless of their formats. The software copies files with the size under 256 KB only. 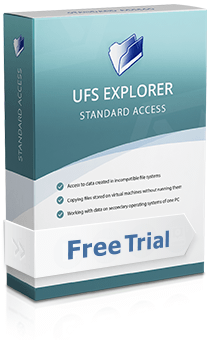 UFS Explorer Standard Access is a helpful utility for Windows which allows getting access to files that were not lost, but became inaccessible due to various reasons, including file system incompatibility. The software provides immediate access to data stored on virtual machines without the need to run them and on secondary operating systems of the same computer.